(12772, Oklahoma Historical Society Photograph Collection, OHS). Located in Beaver County, seven miles north of Beaver on U.S. Highway 64/270 and two miles west of State Highway 23, Forgan lies between the Cimarron and Beaver rivers in part of the area once known as No Man's Land or the Public Land Strip (Oklahoma Panhandle). 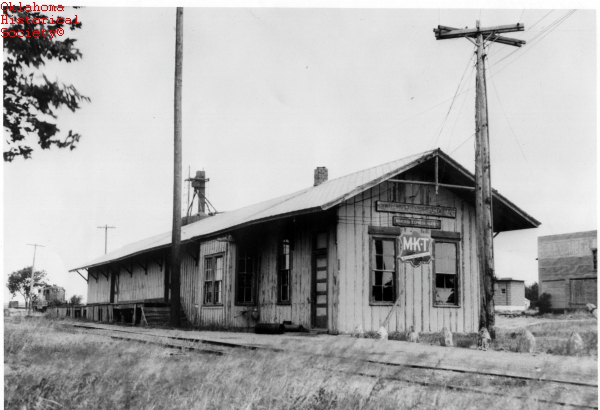 The community began as a railroad town when the Wichita Falls and Northwestern Railway, the first railroad in Beaver County, built west from Woodward to meet the needs of farmers and ranchers in the newly settled area. The name honored James B. Forgan, a Chicago banker and financier. The town was surveyed on January 3, 1912, and the first town lot sale was February 15, 1912. The first business established was the Forgan Town Site Office, with W. L. Beardsley as company representative. L. B. Tooker established the first newspaper, the Forgan Enterprise, on June 6, 1912. Other businesses were three lumber companies, three drug stores, three hotels, and six hauling companies, with a total of fifty-three businesses and four medical doctors. Grain elevators were built to store the wheat prior to shipment on the new railroad. J. H. Lawson built a large warehouse to store broomcorn, a major area crop. The first church in the new town was the Methodist Episcopal Church, founded in 1903 north and east of the present town site and moved to Forgan in 1912. A Baptist Church was erected in 1913. In 1915 the Church of Christ purchased a building from the Methodist Church, to make three churches in the new town. Later, a Christian Church was established as well, and for a time the Pentecostal Holiness Church occupied a former grocery store on Main Street. The 1920 population stood at 582 residents; climbing to 605 in 1930, it dropped to 428 in 1940 after an exodus due to the Dust Bowl. The 1960 population was 532, but in the next thirty years the number fluctuated. The U.S. Census registered 496 in 1970, 611 in 1980 and 489 in 1990. After the railroad closed in the 1970s and a downtown fire occurred in the 1990s, only fifteen businesses remained at the end of the twentieth century, one of which was a water service, supplying the oil and gas industry. This company became one of the town's largest employers. However, due to a grant, the town rebuilt the sidewalks, installed new streetlights, and created an attractive Main Street. At the turn of the twenty-first century the economy was based on wheat and milo farming, ranching, the oil and gas industry, and corporate hog farms. There were four mainstream churches, a Senior Citizens' Center, and a Community Center. In 2000 the U.S. Census reported a population of 532. In 2010, 547 people lived there. Gladys Eagan, ed., Beaver County History, Vol. 2 (Beaver, Okla.: Beaver County Historical Society, 1971). V. Pauline Hodges, "Forgan," The Encyclopedia of Oklahoma History and Culture, https://www.okhistory.org/publications/enc/entry.php?entry=FO026.